If you are just starting out, I recommend reading the first (basics about Media playback on Android) and second (Creating a Service to Play Music in the background) parts before proceeding. 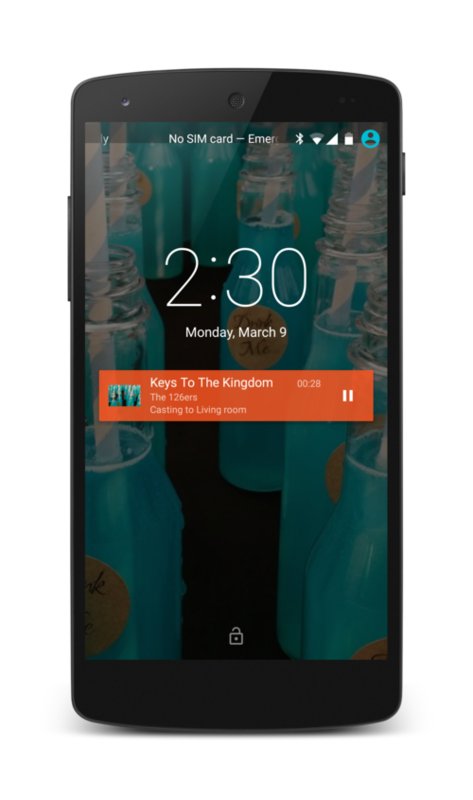 This post will discuss how to show Media Player controls on the lock screen and the notifications. The first thing for this to work is to register a Media Session in our service. A MediaSession should be created to publish media playback information or handle media keys. We create a new MediaSession in the onCreate() of our Service instance. MediaSession.Callback set with setCallback(Callback) enables us to receive commands, media keys, and other events. Note that we are not calling setActive on the media session yet. We do that only when we receive a play intent for the service and actually start playing some music. We also need to associate the UI that should be launched when the user wants to interact with this session. Let's say we have an activity called MusicPlayerActivity that manages a music player interface. This is how we can set it to launch when the user wants to interact with the session. In order to populate the lock screen with the current track information, Media Session uses MediaMetadata. Remember that we created some meta data in the previous post, but there we were using it as just a way to pass on our media ids to the playback implementation. If you have done that, and created a media session, you are already good to go. It will start picking up information from the meta data to show on the lock screen. If you have the album artwork ready, you can also set it immediately on the meta data using .putBitmap for keys MediaMetadata.METADATA_KEY_ALBUM_ART and MediaMetadata.METADATA_KEY_DISPLAY_ICON. But, what if you have a url to the album art? Although, MediaMetadata doesn't directly allow putting url's for the album arts, it's pretty easy to load the images asynchronously. Use your favorite image loading library (like Glide, Picasso, Fresco, …) to load the image in the background and then update the meta data when you have the bitmap ready like so. // locked screen and in other places. mController is an instance of MediaController. It is a view containing controls for a MediaPlayer that typically contains the buttons like "Play/Pause", "Rewind", "Fast Forward" and a progress slider. It takes care of synchronizing the controls with the state of the MediaPlayer. We use it to simplify the notification creation process to let the system create a "standard" media controller and register a callback (mCb) that listens to the media controller events. // when in compact view. // it can actually be any valid Android Uri formatted String. Again, we have some code to fetch the bitmap for the notification on the background thread. I leave it to you to use your favorite image loading library to handle that. There is some special handling required for the play/pause buttons since we want to show only one of them based on the current state of the media player. So far, we have the controls on the lock screen and the notification. But, they don't work magically. We will need to listen to user actions on these controls and perform corresponding actions in our Service. Remember that we created the MediaSession and set a callback in the first section. This is where that comes into play. The user events are sent to the media session callback. Here's a sample implementation of the MediaSession.Callback that can be used in your Service. You might need to modify it to fit your needs. If you are following this series of tutorials, it should pretty much fit right through in your application.